For classes, weekend festivals, conferences, and more. if your event spans multiple days, it is best to set it up as a multi-day event. Click the "Add" link on the top right of the menu bar. 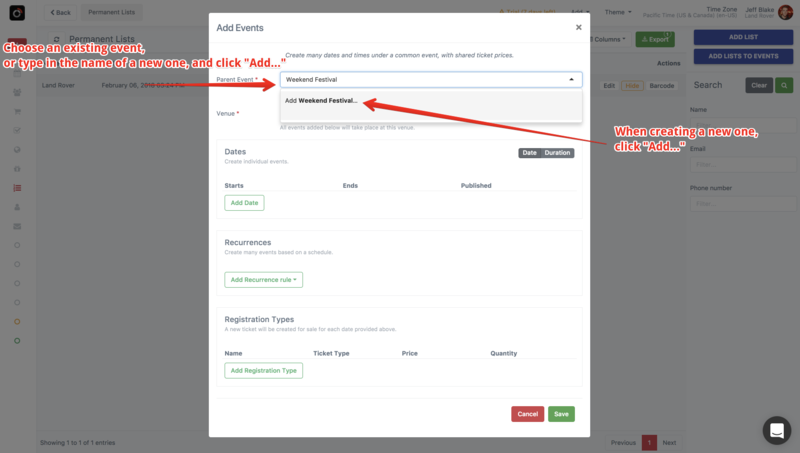 Then, select "Multiple Events"
For the "Parent Event" field, select an existing event from the dropdown to add more dates to an existing event. To create a new event, as we will show here, start typing the name of your new event, and then click "Add..."
What is a good name? This name should be non-date specific. For example, "My Conference 2018", "Weekend Festival", etc are all good names to use. Choose the venue where these events will be held. If your venue is not listed, type in the full name, and then click "Add". From the venue dropdown, simply choose one of your pre-existing venues. If the list is long, you can use the search function. Venue not listed? Type in the full name of the venue, and then click "Add [venue name]...". From the subsequent popup, select the time zone and click save. The rest of the fields are optional. 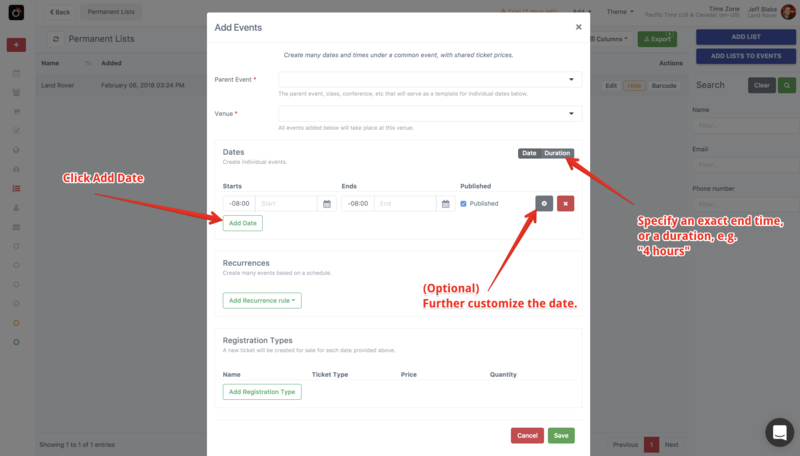 Adding dates (events) can be done by specifying dates individually in the "Dates" section, and/or you can setup recurring events in the "Recurrences" section. For example, if you want your event to occur every Monday, Wednesday, and Friday at 6PM, you would add a "Weekly" Recurrence. On the other hand, if you know exactly your event will occur on a specific Friday, Saturday, and Sunday, then add each of the three dates in the "Dates" section. Details below. If you only have a few dates, for example a weekend festival, then use the "Dates" section to add dates. Click the grey "gear" icon next to the red delete button for a date to further customize. For example, each date will share the same name as their parent event by default. To override this name, click the gear icon. Name: Let's say you have a parent event called "Weekend Festival" on Friday, Saturday, and Sunday. It may be handy to name each individual day "Friday Day 1", Saturday Day 2", etc. Registration types: You can specify registration types that only apply to this particular date. If you do not need to have events automatically created for you, based on a schedule, then you may ignore the "Recurrences" section. Registration types allow you to sell tickets, free RSVPs, registrations, etc. If you do not need this functionality, you may skip this step. 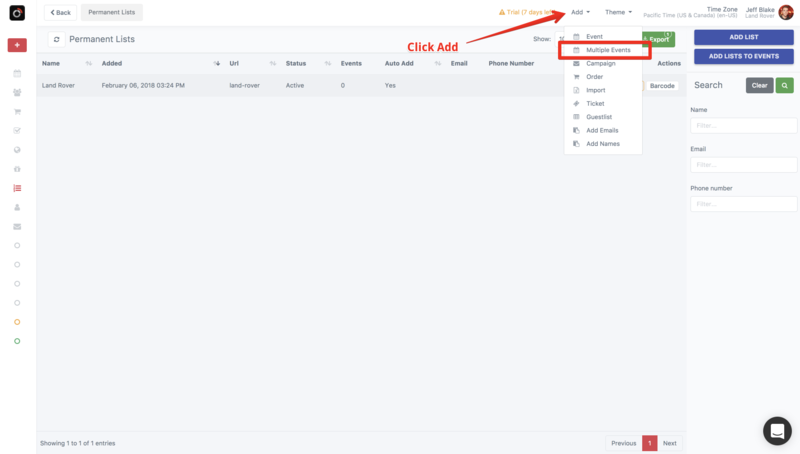 Registration types added to this section will be added to all of the dates specified above, as well as any specified Recurrences. If you want to offer specific registration types available only to a particular date, then click the settings icon ("gear") next to a date (added in Step 4). Ticket Type: The kind of ticket to issue the guest. This is shown on the registration page, and more importantly, shown on the check in app (whereas the Name is not). Try to keep this short, 2 to 20 letters. 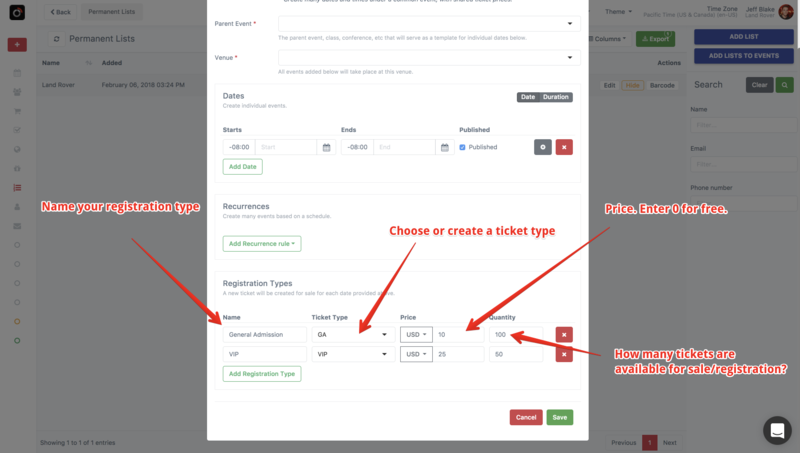 Ticket types are re-usable across events, and serve as a template for some common settings (e.g., how the PDF and Apple Wallet looks). Examples: GA, VIP, RSVP, Ticket, Pass. Best practices: 2-20 letters, Generic, Not event specific. I.e., "Friday Ticket", "My Weekend Conference Pass", etc are bad choices. Price: How much does one of these tickets cost? For free tickets, or RSVPs, enter 0. Quantity: How many of these tickets are available? If your capacity is for 300 GA tickets, then enter 300. For unlimited tickets, leave this field blank. Name, price, and quantity can always be adjusted later. Take a moment to check all the dates, tickets, prices, etc. When you are ready, click "Save".